in the room. Now, everyone who likes shopping online … okay, that’s all the ladies. Everyone happy? Eureka! We may have found the best two complementary things since … gosh, peanut butter and chocolate! 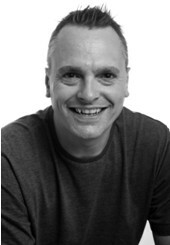 1) Who is Andy Coughlan? Tell us about your background. (AC:) My background is mainly in Web Design and Marketing. Until a few months ago I was a Marketing Communications manager for a Medical Devices manufacturer. Now, I’m a freelancer drawing on my experience building web sites and doing MarCom. 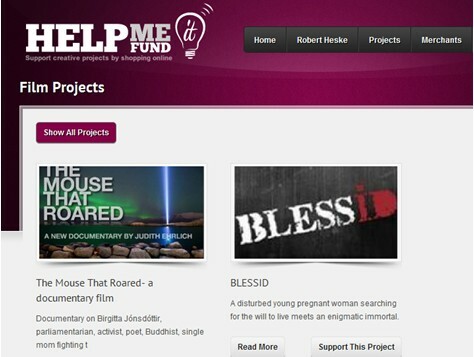 I’m also a bit of a screenwriter and filmmaker, which is where the inspiration for Help Me Fund It (HMFI) came from. I’ve made a few short films, written various spec scripts and edited a couple of low budget feature films. 2) Help Me Fund It sounds like a simple idea. How hard was it to implement? (AC:) The site wasn’t too hard to implement. I’d spent some time in the last few years tinkering with affiliate marketing to try to fund some short films. In the process I built up a large pool of merchants that I could work with. Once I’d had the idea for HMFI, it was quite straightforward to code the site, which I did mainly over the Christmas 2011 break. 3) For those who are unfamiliar with Help Me Fund It, pitch it to us in a few short paragraphs. (AC:) It’s essentially a cashback web site with a twist. Most cashback web sites offer users special links to click through to various merchants and online stores; when the user clicks on these links, they get back the commission from anything they buy. Help Me Fund It takes the idea one step further by allowing the user to choose a creative project to which their commission is donated. 4) What are some of the retailers you have on board? (AC:) Amazon is the most popular retailer, but we have hundreds, with the likes of Waterstones, HMV, Dorothy Perkins and Currys in the UK and Skechers, Ticketmaster, Fathead and Mattel in the US. 5) What other ones will you be adding soon? (AC:) We’re adding new merchants all the time, although it’s usually a case of “wait and see” who turns up. I’m hoping to get more US merchants on there in the next few weeks. 6) What was your “Ah-Ha!” moment when you came up with the concept? (AC:) The concept came about more through frustration than anything else. 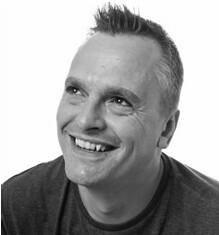 As I say, I’d been tinkering with Affiliate Marketing for a couple of years and hadn’t had a lot of success. Various projects had fallen by the wayside because I just couldn’t get the traffic to the sites. I’d also been looking at Kickstarter and IndieGoGo, and saw quite a few of my friends try it and not get very far because they couldn’t find anyone willing to donate money, especially as, at the time, the recession was just really starting to bite. At the same time, I was reading more and more about how Internet shopping was taking off big time. So it struck me that there might be a gap in the market for a Kickstarter type funding site that didn’t rely on people having to go out and find donors. If people are shopping online for things that they need – clothing, groceries etc. – why not get them to help as well? 7) Explain how you came up with your icon — the lightbulb with “IT” against a purple backdrop. (AC:) The logo was designed by my friend, David Sturgeon, so I can’t claim any credit for it. We tried various ideas that were based around money, which made more sense as to the purpose of the site, but at the same time made it look like we were in the business of simply giving out money, which we are, but only after a bit of effort on the part of the project owners to sell the concept and got people to use the site. So instead I decided to use the light-bulb idea to reinforce the creative aspects of the projects that the site was designed for. 8) What were your biggest obstacles in getting Help Me Fund It off the ground? (AC:) The biggest obstacle has been getting people to use the site. I was somewhat surprised with the apathy that the site met with when it was first launched. Apart from a few friends, no-one seemed particularly interested. It’s been quite a long, slow struggle to build up a following and get people to use the site. I think a lot of people were scared of being seen to be the first, which is understandable. Also, because visitor numbers were relatively low, those brave enough to put their project on the site weren’t earning a lot of money. I think the most any project has earned so far is around £20 ($30), which doesn’t sound a lot, but when you consider that was done with only about fifteen people actually using the site before they shopped, the potential to earn more is definitely there. 9) How are you using Social Media to create a buzz? (AC:) I’m using Twitter quite heavily to promote the projects on the site and remind people to use the site before they shop. 10) What are your immediate and long-term plans to enhance the site? 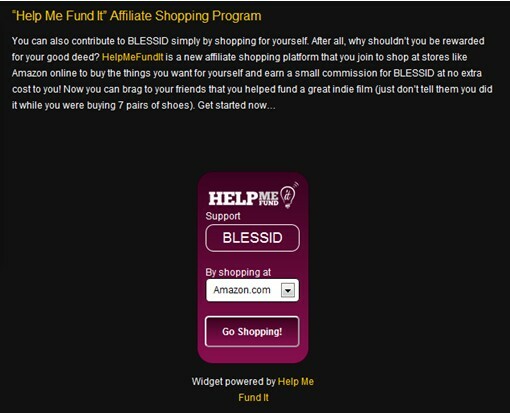 I’ve just added the Help Me Fund It widget that I hope people will embed into their web pages and blogs. This provides a quicker and easier way for people to click through to the merchants. I’m also looking to create an Android and iPhone app as well in the near future along with some other useful utilities for the project owners to use to help them promote their project on the site. 11) Help Me Fund It supports creative projects only whereas other popular crowd funding sites are all over the map. Why the focus on arts and creatives? I just wanted to give the site a bit of focus, really. Also, knowing that it might not be generating as much money as people could get through Kickstarter and its ilk, I figured that smaller projects would be the main audience to start with: short films, community theatre, individual artists and photographers etc. As the site grows, so I’m hoping the scope of the projects on there will grow too. 12) Are you a creative yourself, or just a visionary? Yeah, I’m definitely a creative type. Hopefully a bit of a visionary too! I spend most of my spare time creating stuff; writing, designing, coding and filming. I’m currently in the middle of rewriting a spec fantasy screenplay, and I’m hoping to take part in the Fifty Kisses project that’s going on at the moment. 13) Last question, what can our readers do to a) post a project or b) follow you on the web and support projects? I’ve tried to make posting projects as easy as possible on the site. There’s no need even to create a new account as such, it’ll work with your Twitter, Facebook or Google+ account. If you’re interested in keeping up with the latest developments, you can follow us on Twitter (@Help Me Fund It) and on Facebook (http://www.facebook.com/Help Me Fund It). There’s also the widget – even if you don’t have an active project on Help Me Fund It, you can still help promote projects by embedding the widget in your web site or blog. And last of all, if you’re shopping online, don’t forget to check out the site to see if you can help out the projects. It’s simple to do, just support the project and then use our links to click through to your shopping destination. Thanks Andy. What a great concept! I encourage everyone to check out the site and buy yourselves something really good. Cheers!